Credits are the virtual currency used to fully unlock a PLNAR project in the portal. Every new user starts with one free credit, meaning that their first project can be unlocked for free. More information on what's included in an unlocked project can be found here. Each credit is currently equivalent to $10.83. After you've used your complementary credit, you''ll need to purchase additional credits to unlock more projects. To purchase additional credits, click on the wallet icon in the top right corner of your 'Project Explorer' homepage. The number in the upper right portion of the icon represents how many credits you have remaining, in the case of this screenshot, the user has no credits remaining. 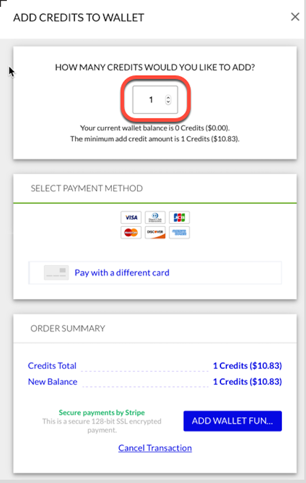 Select the number of credits you'd like to purchase, and then add a payment method. Once you've purchased the appropriate number of credits for the projects you'd like to unlock, you're set!